Collecting Banknotes is enjoyed by millions around the world as we all come in contact with paper money on a daily basis and notice the beauty of engraving and design displayed on banknotes. If you have a banknote collection, or wish to start one, iHobb.com has all of the archival album, sleeves, holders, tools and supplies that you will need to maximize you enjoyment of the hobby and properly display and preserve your banknote collection. All at discount prices, we offer a broad range of currency collecting products and banknote albums from the top suppliers on the market. 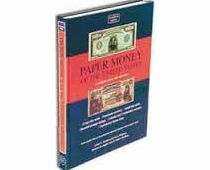 Banknote Albums for collecting of currency and banknotes. Chose from several album types to fit your collection. We offer currency albums from Lighthouse, SAFE, Lindner, Dansco, SuperSafe and others to meet your collecting requirements and budget. All Banknote Albums from iHobb.com are with archival pages to protect your collection from the degradation of acid and softeners found in inferior album pages. Archival safe crystal clear, semi-rigid currency sleeves are ideal for protecting or displaying your banknote collection. Sturdy clear inert plastic currency sleeves offer both-side visibility with protection for your valued banknotes. Electronically sealed edges allow easy handling and stacking. In three grades and as many sizes, sleeves are closed on three sides with an opening at the top (long side) for storage in our Red Chipboard Boxes. Currency Pages from Lighthouse, SuperSafe and Cowens, including the popular Vario and Grande currency album pages, or the SuperSafe three-pocket and four-pocket pages, each fitting into three-ring binders to make an ideal storage solution for banknotes. Easy insertion and removal of banknotes without sticking or creasing. The transparent sheets ensure a double-sided view of the banknotes. Knowledge is Power! Increase the enjoyment of collecting by knowing the value of your banknotes, as well as information about the banknotes in your currency collection. A collection that is properly identified, properly valued and properly graded is at the heart of a well built collection. The allure of banknote collection is to a significant degree the attraction of the beauty of engraving that denotes the banknotes in your collection. A good magnifier is an essential tool for the full enjoyment of the hobby, and for finding the secretes to value in many instances. Our optics shop will direct you to the many options available for the hobby. We currently have a small lot of Bank of Korea banknotes dating from the 1970s to more recent banknotes of higher denominations. Enjoy a viewing of these fabulous examples of the engravers art. Prices are kept low as we are not putting iHobb.com forward as currency dealers, but only a banknote album and supply source.